mm432: Danger? You bet your asteroid there’s danger! From the We Don’t Have Enough on our Plates Dept. (not me! 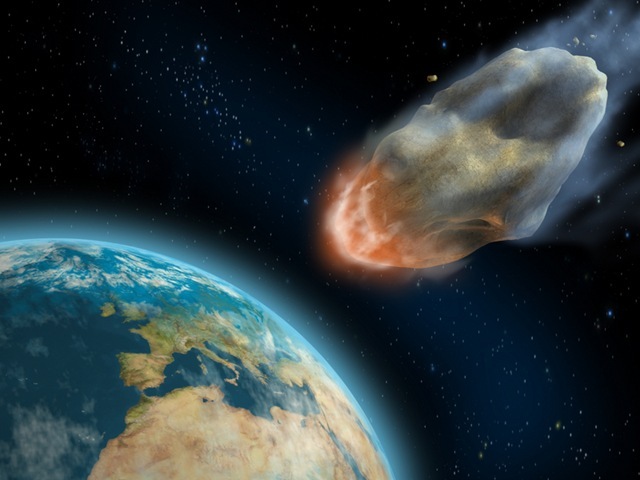 I worry about the global economy, my home’s value, fuel prices, food shortages, and racist, redneck voters just to name five of the topmost), comes this calmly frightening tale of the cataclysmic dangers we potentially face from asteroids. THE Earth is pockmarked with the evidence of ancient collisions — huge craters blasted into its surface by asteroids or comets. One such object, striking 65 million years ago in the Yucatán in Mexico, is believed by some experts to be linked to the demise of the dinosaurs. For a decade, NASA has been busy trying to identify what else is headed this way, particularly those potential “civilization killers” of 1 kilometer (.62 miles) or more in diameter that have orbits coming within 30 million miles of the Earth’s — too close for comfort by space standards.